Boil a pot of water over high heat. 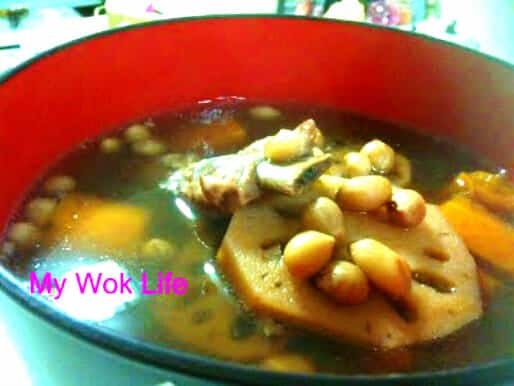 Place blanched pork ribs, carrots, lotus roots and peanuts into the pot. Bring it to a boil again. Reduce heat to low fire, and simmer for 3 hours. Add salt to taste. Serve hot. If you are a working class, and wish to have a bowl of nice hot soup served in your dinner after work, use slow cooker to do the cooking! Place water and all ingredients into the croak pot and place it in the slow cooker. Turn on to auto shifted/ low heat mode. Let it simmer till evening or after work. Add salt to taste before serving it. And, there is nothing easier than cooking a heart warming and delicious soup, and then indulge it with for your loved ones after a long day or during some chilly nights. What do you think (smile)? A bowl of lotus root and peanut soup counts about 200kcal. Tips: Wash the lotus root very thoroughly to remove the mud on it. Then, use some salt to scrub the entire root, rinse and ready to slice. Or, you may try to get those which have already been cleaned (and/ or packed). You may find it in wet markets and many supermarkets in Singapore. *Peanuts and lotus roots should be cooked till soften. * Soup may present slightly opaque in colour due to the immersion of the essence of peanuts (with skin) after long simmering. I was wondering if i can use chicken instead of pork ribs for this? Put more lotus root and peanut if u put more water for bigger pot of soup. Add enough salt to taste is also important. Usually I will put abt one teaspoon for 1500-1800ml of soup. Yes, can use chicken, but it will taste even better if you use chicken feet to cook! After soaking the peanut overnight do we keep the water tats use to soak the peanut? Or we discard the water? For me, I discarded the water after soaking.